Mosquitoes | Pest Control Omaha - Exterminator | Omaha Pest Control, Inc.
Omaha Pest Control has many years of experience controlling these pests. Mosquitoes are a very common pest in and around Omaha, Nebraska. The house mosquito is really a type of fly with a thin body, thin wings and long legs. Only the female mosquito will feed on human and animal blood. While annoying, our blood provides necessity nutrition for the development of their eggs. 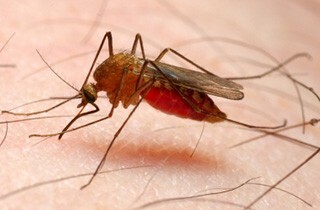 The male mosquito does not have mouth parts that can pierce human skin, so instead it feeds on nectar. Mosquitoes can be a problem if you have standing water on your property. This is where they prefer to breed and lay their eggs and only a small amount of water is required. Call us at (402) 250-0425 with any questions. Mosquitoes are pesky pests and can spread disease such as West Nile Virus, dengue and malaria. More commonly, though, mosquitoes threaten family events more than health. Even the family dog can become infected with canine heartworm through a mosquito bite. How Dou You Get Rid Of Mosquitoes?